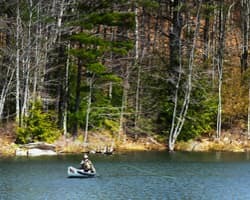 The Maine Department of Inland Fisheries and Wildlife (MDIFW) initiated comprehensive planning in 1968 and have refined and expanded the process with each planning update. In the past, the Department developed separate statewide management plans for each fish species. In 2016, MDIFW will collaborate with Maine citizens to develop a new Statewide Fisheries Management Plan, with a different format from our historic individual species plans. This Plan will outline the statewide goals, objectives, and strategies for the Departments Fisheries Management Program, including content on individual fish species as well as larger issues such as angler access, management of invasive species, and the hatchery program. MDIFW has contracted with Responsive Management (Harrisburg, Virginia) to conduct a formal scientific survey of anglers, and to host regional public meetings and focus groups. A steering committee will provide guidance and advice to MDIFW during the development of the Plan. In addition, MDIFW may convene subcommittees to work on certain aspects of the Plan under the guidance of the steering committee. Please check out the links below for more information on the planning process. If you have questions about the process or would like to submit comments, please contact the appropriate person below. Steering Committee (PDF) The steering committee serves as the sounding board for MDIFW on both overall process and initial plan components and drafts, reviews and provides input on draft goals, objectives, and strategies that are developed by MDIFW and subcommittees, and provides feedback to MDIFW on time-sensitive issues involving the development of the plan.